Freeze, one of the most influential shows in British art history, is now 30 years old. As the art historian Bruce Altshuler wrote in his magisterial history of exhibitions, Biennials and Beyond: Exhibitions that Made Art History, 1962-2002, the show “is legendary as the originating moment of the Young British Artists (YBAs), seen as having played a founding role similar to that of many artist-organised exhibitions in the history of early Modern art”. The artist-organiser in this instance was 23-year-old Damien Hirst. But it was a collective enterprise: Hirst was unquestionably the leader, but 15 fellow Goldsmiths College students and recent graduates – among them Mat Collishaw, Sarah Lucas, Ian Davenport, Gary Hume and Michael Landy – were his dedicated collaborators. Just before the Freeze private view. 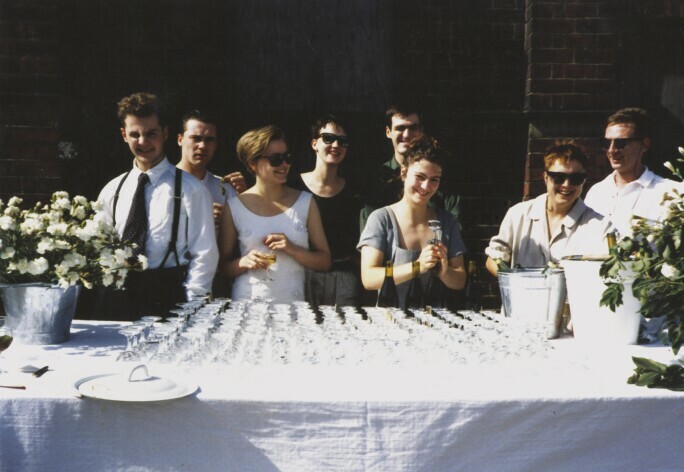 From left: Ian Davenport, Damien Hirst, Angela Bulloch, Fiona Rae, Stephen Park, Anya Gallaccio, Sarah Lucas and Gary Hume, August 1988. Photo: Abigail Lane. © Abigail Lane. All rights reserved; DACS/Artimage, 2018. The narrative that the show was “very contrived and very calculating” is false, Davenport says. “I think it happened much more naturally than that. Of course, people were ambitious and they wanted to do the best thing they could. But we weren’t taught how to do this at college. It happened much more organically.” He remembers that “there were some really fantastic pieces in that show: Mat Collishaw’s Bullet Hole photograph  is still, to this day, a fantastic piece of work, really incredibly powerful, and Michael Landy had these wonderful tarpaulins of draped blue that were pinned up on one of the walls.” Hume showed early versions of his door paintings, which remain some of his best-regarded work. Hirst’s own contribution was mixed. In the final part of the exhibition, he made his earliest spot paintings, directly on the wall – but in the first, he showed a cluster of coloured boxes. A photograph from the time captures Davenport helping Hirst to install the boxes, “but then I came in the next day and he had decided to take it all down and move it all around again”, he says, with a laugh. Landy recalls that “they were up in the rafters, and then when you came in to invigilate the exhibition, you’d find a couple more on the floor, because he hadn’t stuck them together properly”. Both Davenport and Landy say that “one man and his dog” came to see the exhibition while they were invigilating it. But very quickly, a good number of the Freeze artists were showing widely, at home and abroad. Many have never looked back. “What’s been fantastic is that a lot of the artists in that show have maintained a really high level of showing their work all over the world and have become internationally well-known,” Davenport says. “That’s quite extraordinary, when you think about it.” Perhaps most extraordinarily, the maker of those errant painted boxes, who many considered a curator in the making, has, in Davenport’s words, “got to be one of the world’s most famous artists”.